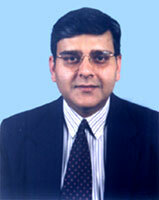 Dr. Malhotra is a senior consultant in Ophthalmology with over 20 years experience. Today he is the Director of Sunetra Eye Centre and also a senior consultant at IP Apollo Hospitals. After his post graduation from Delhi University in 1990, Dr. Malhotra did a fellowship at the famed Sankara Nethralaya under his Guru Padma Shree Dr. S.S. Badrinath in 1991-92. His vision of setting up a complete eye care center took him to London and to Canada to study the Exciter Laser. Sunetra Eye Center was more or less fully equipped already but there was a lacunae. Till 1995 Delhi was still performing the age - old Radial Keratotomy procedure. In Canada he visited Dr. Howard F Gimbel who is considered a stalwart in Cataract and refractive Surgery. Dr. Malhotra was a pioneer in bringing the Excimer Laser to Delhi in 1995 and started performing PRK photorefractive Keratectomy). The Excimer that Dr. Malhotra uses is a FDA Approved Laser for LASIK. Considering the limitations of PRK Dr. Malhotra decided to move to a more optimal procedure LASIK for the correction of vision. He got trained in California, USA and began LASIK in 1998. He again pioneered the use of the 'superior hinge flap' here in Delhi with the advent of the modern surgical technique of LASIK. Dr. Malhotra's quest for excellence does not end here. His visit to The International Nidek Meeting in Monte Carlo in December 2001 and his talk with Engineers and other stalwarts in the field of refractive surgery showed that wave front guided LASIK may be beginning for our quest for 'Supervision'. Today Dr Malhotra is equipped with new wave front measuring devices known as an aberrometer which measures aberrations in the individuals eye apart from the normal number corrections and a special final fit program' that individualizes and fingerprints each patient eye treatment. His resolve is to provide only the best for our patients equal to and if not better than anywhere in the world. He also believes that Refractive Surgery is not for all patients and sifting out the patients not eligible for the surgery is equally important. He has traveled all over India to impart training and performed thousands of LASIK surgeries all over the country. Apart from LASIK or Customized ablation as the rewer treatments are known Sunetra Eye Centre provides comprehensive eye care in all fields such as cataract surgery with phacoemulsification (no stitch cataract surgery), retinal and vitreous surgery, glaucoma treatment and management and a wide array of investigative procedure such as fundus fluoerscein angiography, ultrasound of the eye and detailed eye check ups. A special interest is with diabetic eye disease. Other Lasers a Sunetra Eye Center are in use for treatment of diabetic eye disease and retina holes(continuous wave green laser) and the Nd Yag laser for removal of after cataract membranes. There is a continuous upgrade of software and hardware and additional equipment are added as required.